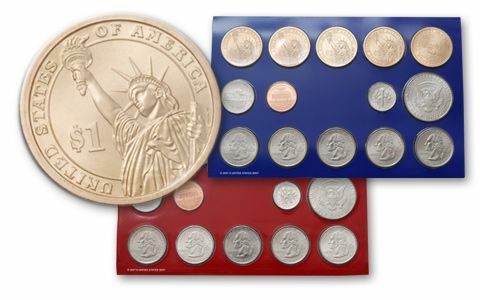 About the sets: The coins in the 2009-PD Mint Sets were Uncirculated pieces pulled from regular production runs, thus the quality of the individual coins varies widely from set to set and even within a set. One example of each of the following from the Philadelphia and Denver Mints: Oklahoma Quarter, New Mexico Quarter, Arizona Quarter, Alaska Quarter, and Hawaii Quarter (all Copper-Nickel Clad). 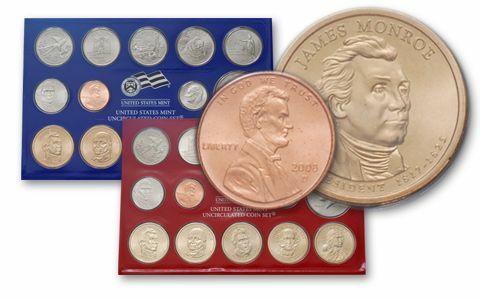 The four Presidential Dollars are James Monroe, John Quincy Adams, Andrew Jackson, and Martin Van Buren (Copper-Nickel Clad). 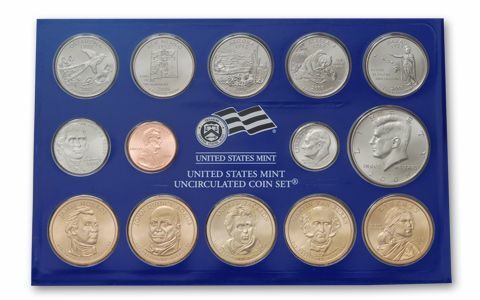 About the sets: The 2008-PD Mint Set marked the final five Statehood Quarters from the original ten-year 50 State Quarters program. The program was so popular with collectors that it was extended in 2009 to include U.S. territories as well. 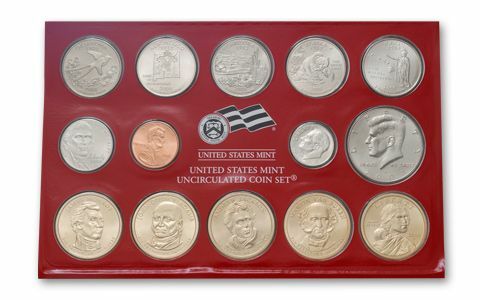 The 2008-PD Mint Set is also notable for including the final Sacagawea Golden Dollar before the series was re-launched as the Native American Dollar series in 2009. Original packaging: The 2008-PD Mint Set consisted of two different sets in two blister-style folders. The blue folder contains coins from the Philadelphia Mint, the red folder contains coins from the Denver Mint. Each folder contains the Cent, Nickels, Dime, Half Dollar, and Dollar, alongside the following five 2008 Quarters from the 50 State Quarters® program: Oklahoma, New Mexico, Arizona, Alaska, and Hawaii. Completing each folder are the four 2008 Presidential Dollars: Monroe, Adams, Jackson, and Van Buren. After three decades as the Chairman of Microsoft Corporation, Bill Gates steps down. Stock markets around the world plunged amid growing fears of a U.S. recession, fueled by the 2007 subprime mortgage crisis. U. S. Senator Barack Obama was elected the 44th President of the United States. Barack Obama became the first African-American President-elect. Actor Charlton Heston passed on April 5th, and Paul Newman died on September 26th. SpaceX Falcon 1 becomes the world's first privately developed space launch vehicle to successfully make orbit. The 2008 Summer Olympics take place in Beijing, China. Chinese athletes won the most gold medals, with 51, and 100 medals altogether, while the United States had the most total medals with 110. Fidel Castro announces his resignation as President of Cuba. Human remains found in 1991 are identified as Tsar Nicholas II of Russia, using DNA analysis.